On September 11, 2006, the fifth anniversary of the tragedy, the monument To the Struggle Against World Terrorism was dedicated. The ceremony started with the performance of the National Anthems of the United States and the Russian Federation. 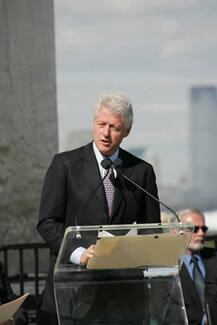 Former United States President William Jefferson Clinton was the keynote speaker. Sharing the podium with him were the Honorable Sergei Mironov, Chairman of the Council of Federation of the Russian Federal Assembly; Michael Chertoff, U.S. Secretary of Homeland Security; John S. Corzine, Governor of New Jersey; Bill Thompson, Comptroller of New York City; Joseph Doria, Mayor of the City of Bayonne; Zurab Tsereteli, the artist and President of the Russian Academy of Arts; members of the United States Senate; members of the Presidium of the Russian Federation and family members of the victims of 9/11. Together with the distinguished speakers, hundreds of residents of New York and Bayonne, as well as other representatives of the American and Russian public, stood in memory of those who died. 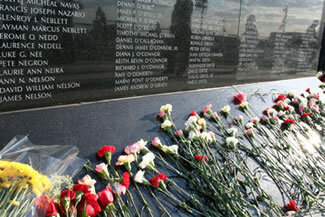 After the ceremony, those attending laid flowers at the Monument’s base, which bears the names of all those who perished.